You may be looking for Slizer, a minifigure from Space Police. Notably, while LEGO has used ball joints in the past, the Slizers were the first LEGO figures to use ball joints for articulation and movement. Each Slizer/Throwbot had at least one disk arm, which could throw a disk when pulled back and released, and most had a screw-and-gear configuration that allowed movement of the head. The design of their feet would later be reused in BIONICLE in a similar fashion (though not for the Toa). Each Slizer/Throwbot has one to six throwing discs that match one of his colours. The discs depict the Slizer/Throwbot or their surroundings in some form, doing something. These pictures, especially those of the last four Slizers/Throwbots, can be confusing to interpret. On the left portion of the grey metallic picture frame is a wider frame section made up of eight lights, either green, yellow, or deactivated. However, Millennium/Millennia has nine lights on his single disc. It is unknown what these lights represent officially, but it possibly could represent the discs' power levels. Most of the Slizers/Throwbots, with the exception of Flare, Millennium/Millenia, and Blaster, each have six discs depicting the following. The Two green lights: A large grey carving/cutout/symbol of their "element"/home. Behind the symbol is a scene of their home. Fire/Torch: A carving of a flame before a wall of fire. Element is Fire. Ice/Ski: A carving a snowflake, in front of a snow-covered landscape. Element is Ice. City/Turbo: A carving of a city skyline, in front of a city. Element appears to be Technology/Metal. Sub/Scuba: A carving of a water droplet, underwater, with the sun shining behind. Element is Water. Judge/Jet: A carving of seven arrows pointing in different directions, in front of a yellow-and-black striped wall. Element appears to be either Air or simply Gas in general. Jungle/Amazon: A carving of a leaf, in a jungle. Element is Flora/Plants. Rock/Granite: A carving of a mountain, in front of a desert landscape. Element is Earth. Energy/Electro: A carving of a lightning bolt, within a lightning storm. Element is Electricity/Lightning. Flare: The asteroid heading towards Planet Slizer/the Throwbots Planet. Element appears to be Space or even Radiation. The Three green lights: The Slizer/Throwbot, in his usual habitat, is throwing a disc at the viewer of the picture. Fire/Torch: Throwing a flaming disc, while walking in a lava lake. Ice/Ski: Throwing a disc, while skiing downhill. City/Turbo: Throwing a disc, while emerging from an underground sewer. Sub/Scuba: Throwing a disc, while stepping forward, underwater. Judge/Jet: Throwing two discs, while flying in space. Jungle/Amazon: Throwing a disc, in a swamp. Rock/Granite: Throwing a disc, while standing on the edge of a cliff. Energy/Electro: Throwing a disc, while flying within a lightning storm. Spark: Throwing a disc towards the sky while firing white energy beams from his energy zapper in a slightly different direction, within a narrow canyon. The Four green lights: The Slizer/Throwbot is traveling using his carrying case as a vehicle. Fire/Torch: Escaping from small, living fire-comets shooting out of volcanic craters. Ice/Ski: Traveling within an ice cave, breaking a column. Sub/Scuba: traveling into an underwater canyon, with a shark above and what appears two be a squid outside. It also might be noted that Sub/Scuba's case is a different color than it was on the set. City/Turbo: Flying up towards the sky, after traveling beneath a bridge. Judge/Jet: Traveling in space with at least five other carrying cases traveling in the background. The four carrying cases that are clearly shown are of Fire/Torch, Ice/Ski, Sub/Scuba, Jungle/Amazon, and Energy/Electro. A dark black planet is in the background, and the six Slizers/Throwbots are flying away from it. Jungle/Amazon: Traveling through a swamp, snapping a vine. Rock/Granite: Flying across the sky, breaking a tall rock formation. Energy/Electro: Escaping from a monster composed of lightning. Spark: The asteroid impacting Planet Slizer/the Throwbots Planet. The Five green lights: The Slizer/Throwbot is using one or more of their special powers. Fire/Torch: Making a canal for living lava using his Hand of Fire. Ice/Ski: Skiing into an icy spike-trap. City/Turbo: Jumping over a city wall, with two spotlights above him. Sub/Scuba: Transformed, creating a whirlpool around a creature with at least two green tentacles. Judge/Jet: Firing an energy beam at another Slizer/Throwbot from his right hand in a battle. Jungle/Amazon: Swinging on a vine, chopping down a tree. Rock/Granite: Producing an energy shield from his hand, protecting himself from an avalanche. Energy/Electro: Electric power entering (or perhaps exiting) his body through his left eye. Flare: Dive-bombing something that is exploding on the ground, with at least two other Flare-like Slizers/Throwbots flying in the same direction. The Six green lights: The Slizer/Throwbot is battling a natural enemy of their home. Fire/Torch: Meeting a monster entirely composed of fire emerging from a crater. Ice/Ski: Escaping from an avalanche monster, as he skis off a cliff. City/Turbo: Escaping from a large truck through a messy alleyway. Sub/Scuba: Fighting a large jellyfish underwater, with tentacles wrapped around his right arm and right leg. Jungle/Amazon: Fighting something resembling a giant carnivorous plant within its mouth, its multiple tongues grabbing at him. Rock/Granite: Meeting a large skull-shaped monster composed of rock, with red lights, possibly eyes, in its eye sockets. Energy/Electro: A monster resembling a tornado composed of lightning is shocking him. Blaster: Charging viewer, with what look like at least five other silhouettes of Blaster behind him. The Seven green lights : What the Slizer/Throwbot tries to find to become more powerful. Fire/Torch: Diamonds to increase the power of his Hand of Fire. City/Turbo: Fuel to increase his speed. Sub/Scuba: Pearls to help him breathe underwater. In the picture, the pearl is being held by a tentacle. Rock/Granite: Plasma. In the picture, it is shown as a river of plasma at the base of cliffs. Energy/Electro: Atom-like object to help him absorb more energy from lightning storms. Blaster: Blaster, with two standing flares beside him, and what appears to be an explosion behind. Millennium/Millennia: The Slizer/Throwbot planet with a light coming out of the judge dome. Millennium/Millennia: Throwing a disc at the viewer of the picture, in motorcycle form. Two variations of the storyline existed; the North American and European versions respectively, each with different names for the characters and settings. 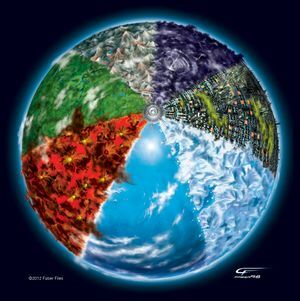 The "Singular Planet" storyline was that there were eight robots fighting a war against each other on one planet split into seven even continents/regions—with the Slizer Dome situated at the North Pole. In this storyline, some have gone to some lengths to say that there were two sides: four were "good" (Fire, Ice, City and Sub), and the other four were "evil" (Judge, Jungle, Rock and Energy).[source?] The concept of facing their respective natural threats in their zones were present, with the inclusion that each of them was trying to find an additional mineral, fuel or other item to make themselves stronger, such as: "Lava Stones" (Fire), "Air Pearls" (Sub), "Ice Crystals" (Ice), "Power Fuel" (City), "Herbal Treesap" (Jungle), "Liquid-Plasma" (Rock), and "Electric Radiation" (Energy). The last power-up for Judge is unknown. In either storyline, all the characters were evenly matched. Both stories reached a climax when a meteor struck the Slizer Planet and blew apart half the planet, annihilating the Energy, Rock, and Jungle Regions, and heavily damaging the Judge Dome where the Judge Slizer resided. In the North American Throwbots storyline, how this could have happened if there were eight different planets is unknown. The 2000 Slizer/Throwbots story was never explained fully, which left dedicated fans with many unanswered questions. The Fire Continent – Torch Continent – Torch Planet This Continent/Planet is composed of solid and molten volcanic rock. Many volcanoes are also present, spewing hot gases into the air. The Fire/Torch Continent/Planet is therefore the warmest of all of the Slizer/Throwbot Continents/Planets. Known inhabitants include living molten rock and monsters completely composed of fire. The Ice Continent – Ski Continent – Ski Planet This Continent/Planet is completely covered with snow and the occasional lake or river. Mountain ranges and ice caves are common. The Ice/Ski Continent/Planet is the coldest of all the Slizer/Throwbot Continents/Planets. Known inhabitants include monsters completely composed of ice/snow. The City Continent – Turbo Continent – Turbo Planet This Continent/Planet is mostly covered with modern and futuristic buildings and structures one may find in a large urban area. Skyscrapers and road bridges are common. The Continent/Planet contains business, industrial, and residential areas. Known inhabitants include a large, living tanker truck and living, green industrial slime. The Sub Continent – Scuba Continent – Scuba Planet This Continent/Planet is almost entirely covered with water. Below the surface, there are many canyons and hills. Known inhabitants include aquatic plants, jellyfish, a plesiosaur-like animal, and sharks. The Judge Continent – Jet Continent – Jet Planet This Continent, which is also the smallest Continent, is mainly the stadium in which the Slizers/Throwbots compete. It looks like an urban industrial area, with large spaces resembling parking lots or helicopter pads. Metallic-looking pyramids are also seen in some images of the Continent. This continent is located at one of the points where the other seven Continents meet. No confirmed natural inhabitants, but a strange net-like being made of energy appears in one image. In the multiple planet version of the story, the jet planet is a gaseous planet, with the same features as the Judge/Jet Continent. The Jungle Continent – Amazon Continent – Amazon Planet This Continent/Planet is entirely covered with jungle and swamp. The plants can vary greatly in height, as the Continent/Planet is green wherever one may be. Many vines are also available for swinging from one place to another. Known inhabitants include the many plants that grow on the Continent/Planet. Notable plants include a tree whose nicks and cracks on its trunk resemble a face (with red glow coming from the “eyes”) and a large carnivorous plant. The Rock Continent – Granite Continent – Granite Planet This Continent/Planet is a rocky desert, very similar to Mars in appearance. There are occasional rivers of water and fluidic plasma. Known inhabitants include a large skull-shaped rock with a red glow coming from its “eyes”. The Energy Continent – Electro Continent – Electro Planet The frequency of lightning storms in this Continent/Planet make the sky and ground seem a purplish colour from a distance. Tornadoes also occasionally form. Known inhabitants include a monster completely composed of electricity and a living tornado. Three comics were known – one which showed the respective Functions of the respective Slizer/Throwbot, one that pictured the Slizer/Throwbot battling in the Slizer dome, and one showing the battle between Robotops and Ultrarex. BIONICLE had a throwing disc function similar to the Slizer disc throw function. 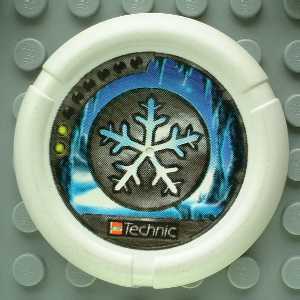 This function was first used in the Power Pack and McDonald's Tohunga sets, then again in many 2004 sets with the addition of a disc launcher system. This page was last edited on 15 May 2017, at 17:33.